The right speaker can turn a standard conference into something truly memorable. Attending an event with a famous or well-regarded keynote speaker can be a great way to learn more about the latest developments in your field and to see what issues are currently being debated. Plus, a great speaker will be entertaining and engaging, giving you a whole new enthusiasm for your work. Daniel Kahneman is known to economists as the winner of the 2002 Nobel Prize in Economic Sciences, and to the public as the author of the hugely successful book Thinking Fast and Slow, which integrates perspectives from both economics and psychology. His academic publications include Heuristics and Biases: The Psychology of Intuitive Judgment, Choices, Values, and Frames, Judgment under Uncertainty: Heuristics and Biases, International Differences in Well-Being, and Well-Being: The Foundations of Hedonic Psychology. His insights into multiple fields make him a skilled communicator who can engage with academics of all different backgrounds, and his questioning of the orthodoxy of behavioural economics is sure to provoke discussion in any economics audience. John Kotter is known primarily for his work on leadership. As the Konosuke Matsushita Professor of Leadership, Emeritus at the Harvard Business School, he has built a reputation as the foremost world expert on leadership, with a particular interest in directing change via leadership. His speeches are popular at corporate events thanks to their applicable leadership strategy tips, but his speeches on leadership in a changing world will appeal to an academic audience too. His presentation style is clear and comprehensible without sacrificing depth, making his talks suitable for people of all different subject backgrounds. Amy Larkin is the Vice Chair of the World Economic Forum’s Global Agenda Council on Climate Change and the founder of the Nature Means Business organisation which promotes the need for businesses to recognise and work on their environmental impact. She is known in environmental circles for her long history of work with Greenpeace, and she is known in the business community for her book Environmental Debt: The Hidden Costs of a Changing Global Economy. Her speeches include analysis of the environmental harm done by corporations, but also advice on how those corporations can improve their environmental policies. Ian Bremmer is the author of best seller The End of the Free Market: Who Wins the War Between States and Corporations? and is known for creating Wall Street’s first global political risk index. His work spans the fields of politics and economics, particularly focusing on how political events have effects on economic markets. Through his work heading the Eurasia Group, a leading global political risk research and consulting firm, he has practical experience as well as the presentation expertise that comes from his numerous media appearances, including appearing regularly on CNBC, Fox News Channel, National Public Radio, and others. Niall Ferguson is an expert in the areas of economics and history, and is the Laurence A. Tisch Professor of History at Harvard University. His speeches focus on the global economy, looking at large-scale changes like globalisation, the growing influence of China on the global economy, and the long-term effects of the financial crisis on world markets. He has presented to television and radio audiences, including a six-part history of the British Empire for the UK broadcaster Channel 4 which he wrote and presented, and his award-winning documentary The Ascent of Money: A Financial History of the World which was broadcast on PBS. He is known for his witty and clear presentations which are as enjoyable for an academic audience as they are for a public audience. 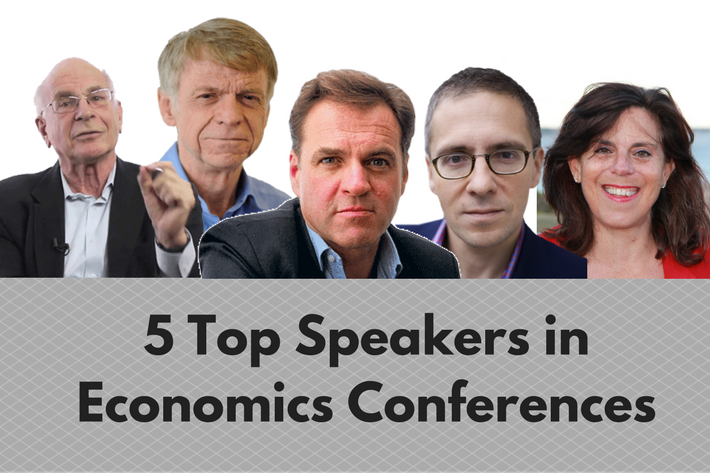 We hope that this inspired you to check out some more economics conferences! For a list of conferences in your field, take a look at our website at CONFERENCEMONKEY.org.